What a festive table. I love those candle holders. I don't think you could find anything cuter than that tablecloth!! 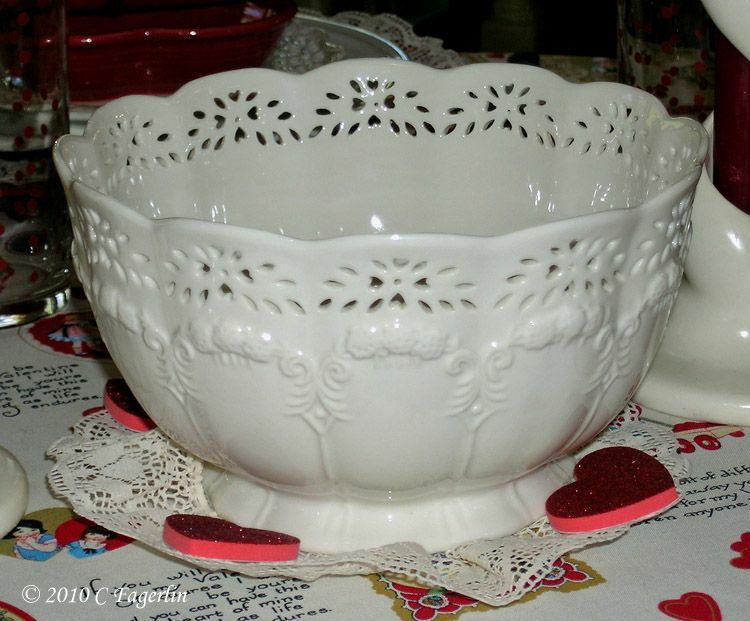 And that cutout creamware is Wonderful!!!!!!!!! Very pretty table setting! You represented Valentine day very well. You have some really neat things. 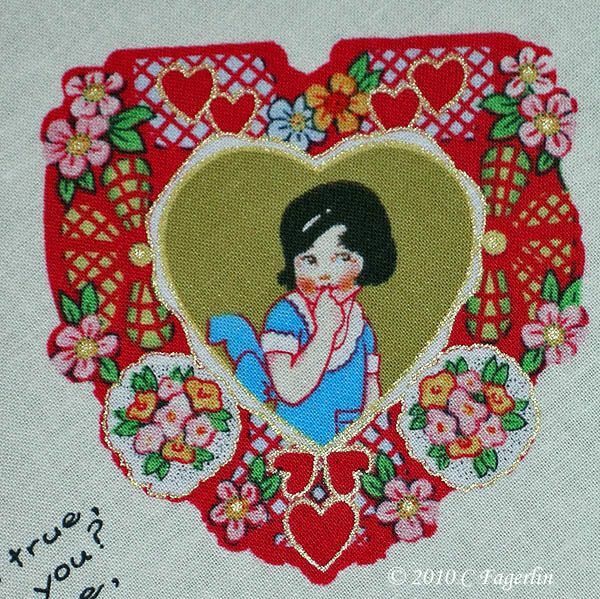 I bet at least some of those valentines on the tablecloth are copied form old Whitney valentines. That looks fab! The tablecloth is so very cute. Who cares if it's old? It definitely has a vintage vibe, and it's beautiful. 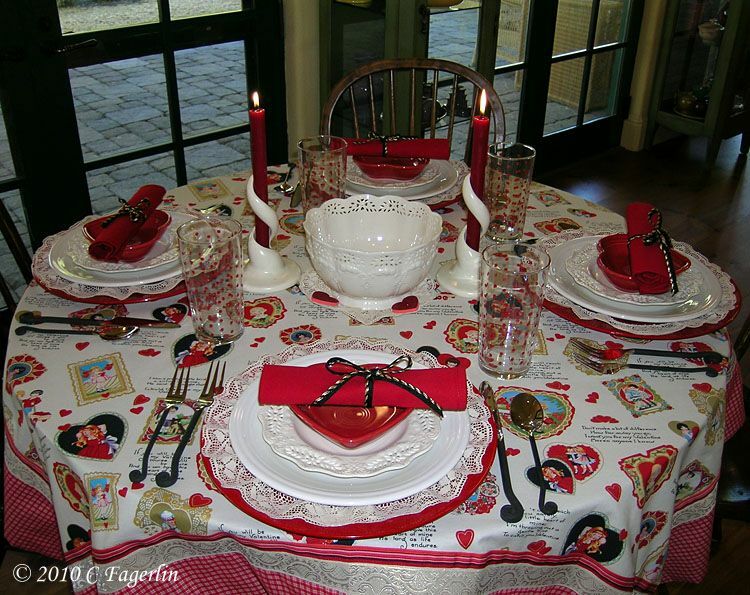 I knew Postcardy would recognize those valentines on the tablecloth! 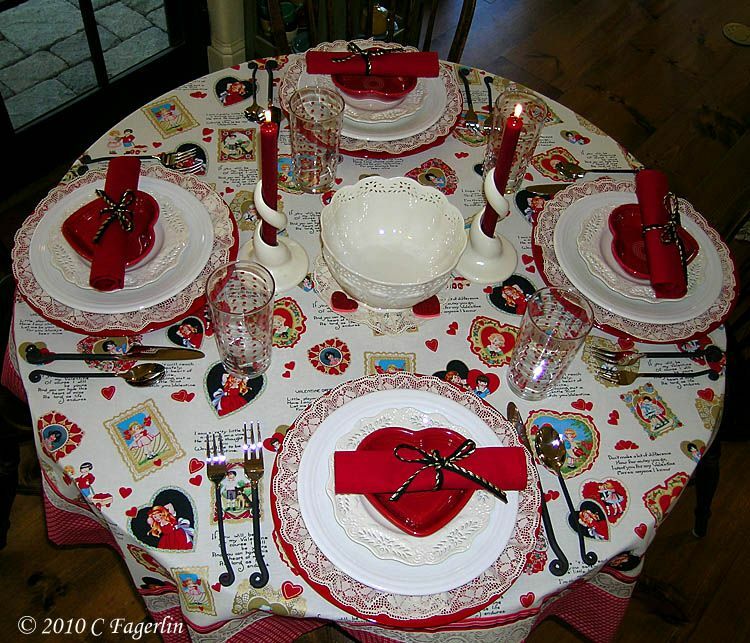 Very sweet Valentine's table. It is beautiful. That is a wonderful tablescape! I love everything about it. 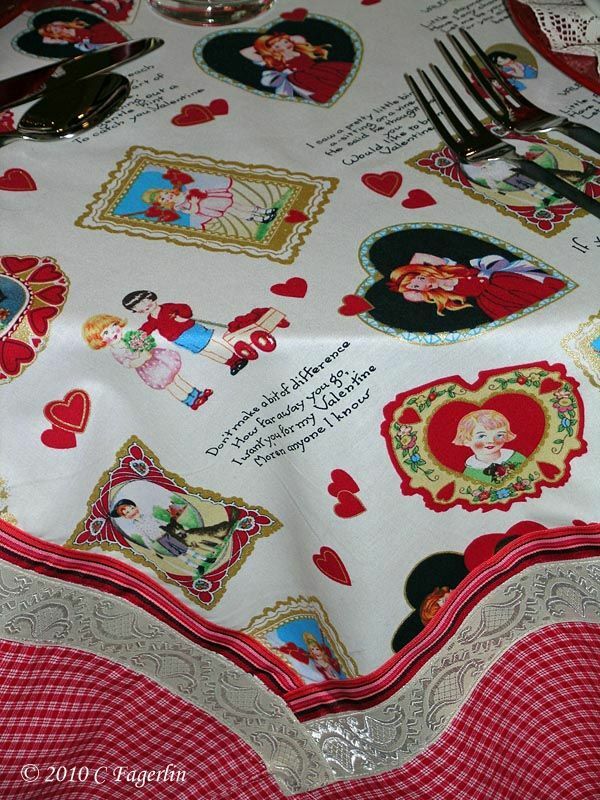 Nice job on the tablecloth, the vintage Valentines rimmed in gold are fabulous! Fabulous table! I wish I had a valentine this year to share a pretty table with. 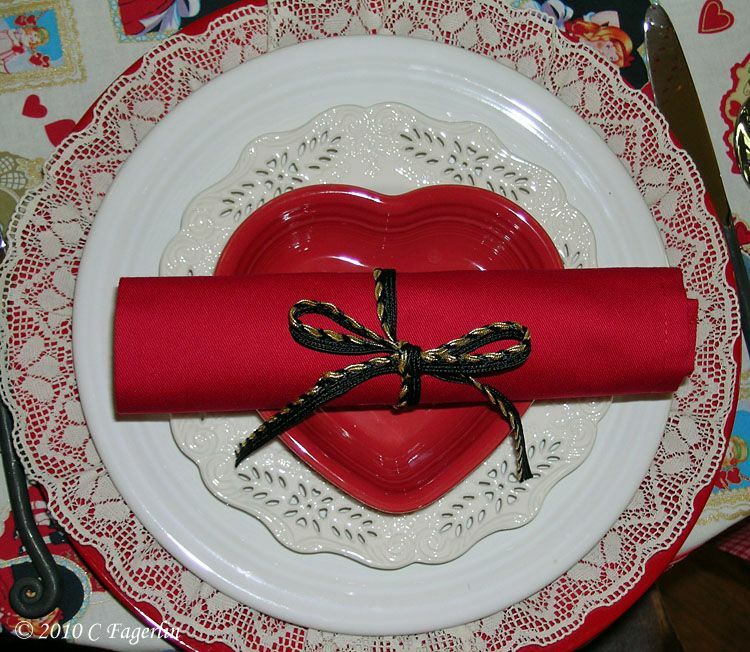 This year my Valentine is my mini Dachshund, Mister T.
Very pretty Valentine's table. Well done. 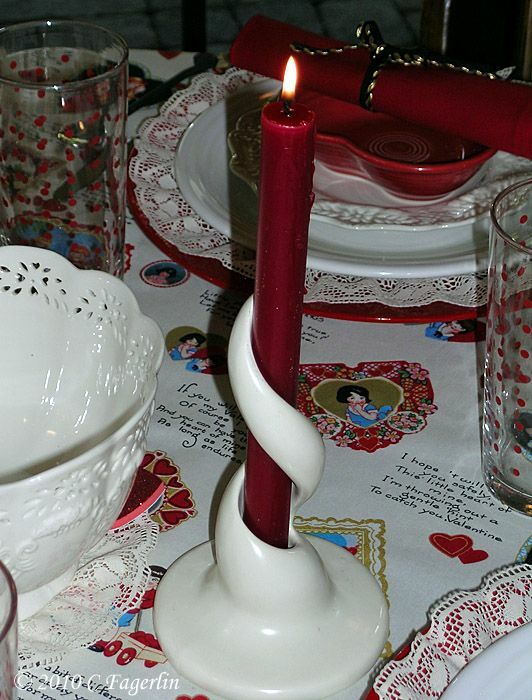 I especially like the bowl on the center of the table and the candle holders, which look like they are reminiscent of the old courting candles- - - just PERFECT for Valentine's Day. Beautiful! 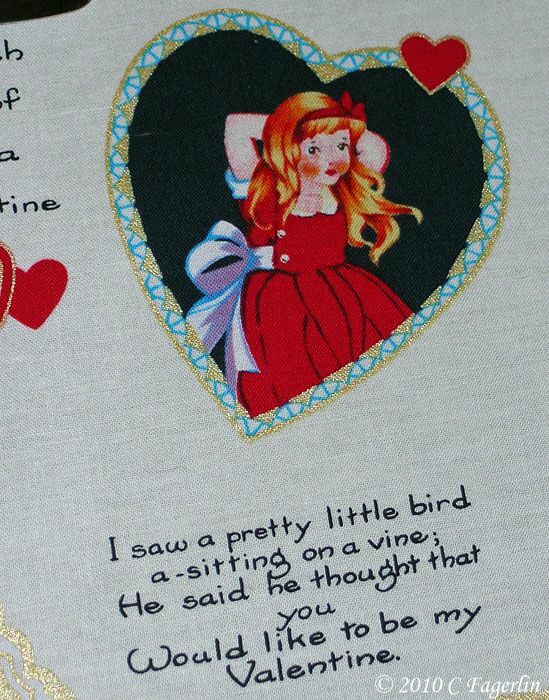 I especially like the way that you layered in lacy pieces--fabric and pottery--to accentuate the outline of the Valentine's on the cloth! 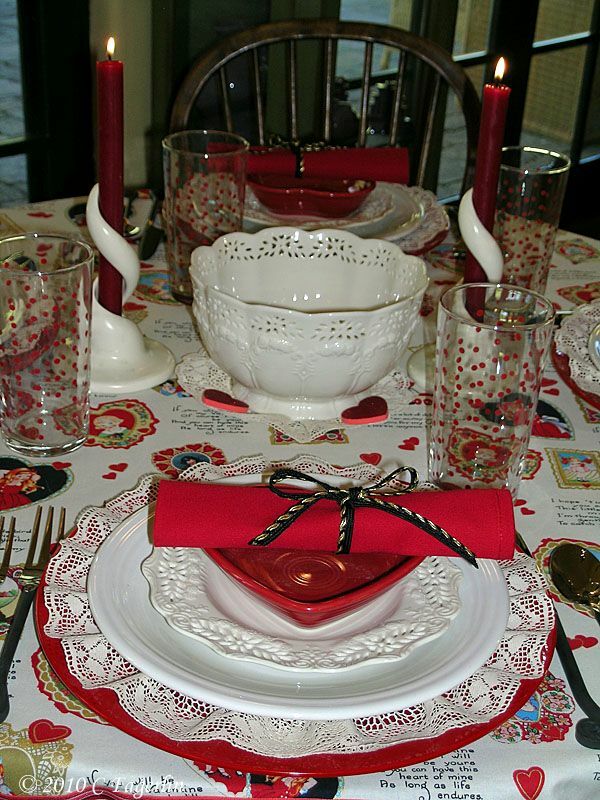 This is the 'LOVE'liest Table Setting! What a great tablecloth for inspiration and to build on. I hope you and the Loves of your Life have a Lovely meal there...no red staining stuff, tho! I love everything about this post. LOVELY tablescape. 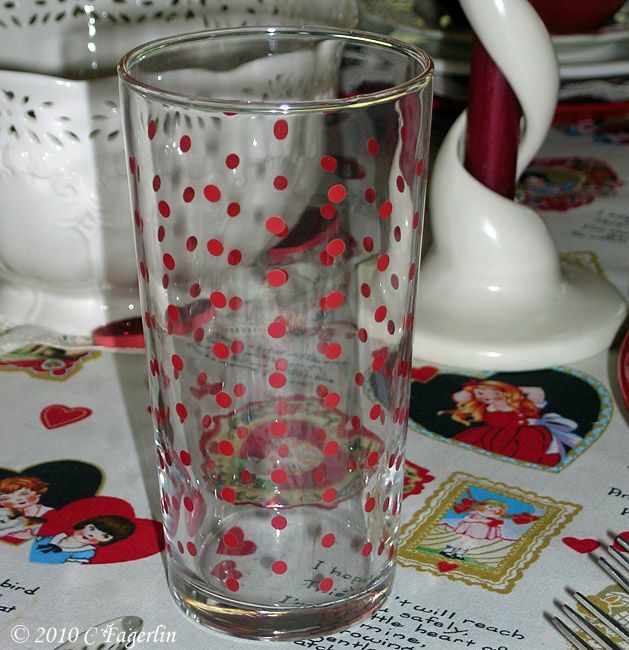 I love the glass tumblers and vintage-looking fabric of the tablecloth. Just delightful. Great job. Ahhh who cares that they weren't vintage the table is lovely and has the look of being old. But my favorite IS vintage you said - the candle holders. I just LOVE them. How different they are. 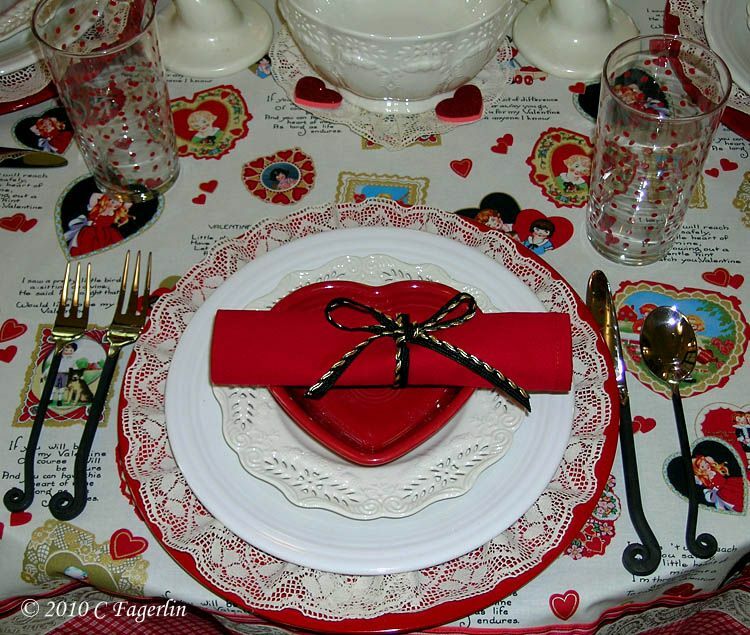 the tablecloth is just adorable, and what a pretty tablescape...you are right, it does have a vintage feel....Happy VTT! Thanks so much for linking in! I just love how you've re-created the vintage look with this tablescape. Beautiful! Even though it isn't authentic vintage It still evokes the vintage feel. Id love to have one like that. Beautiful table. Oh my this is very beautiful. I like your table cloth!! Good Morning, Candy. I hoped you'd share this 'scape again. I really love the tablecloth. 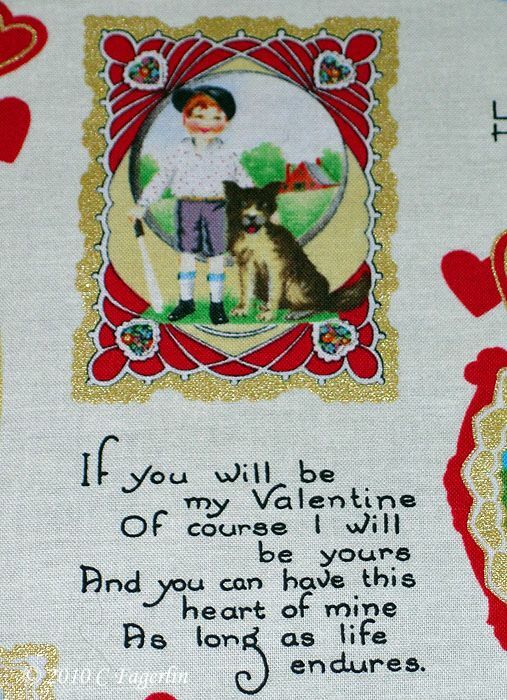 The fabric is wonderful, and I love the border that you created for it. Thanks for sharing this again! 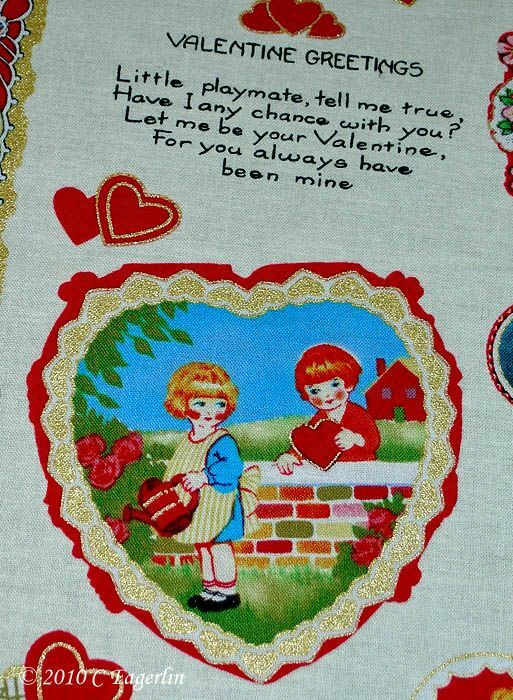 I think I missed the original post ... because I'd surely remember that adorable tablecloth! Thanks, too ... for hosting a VDay party ... can't wait! Great fabric. I love all your attention to detail. The candle holders are fabulous. Thanks everyone for your sweet comments! Lots of new Valentine tables coming up beginning Feb 2nd, so I hope to see you visit again soon. This is so adorable! 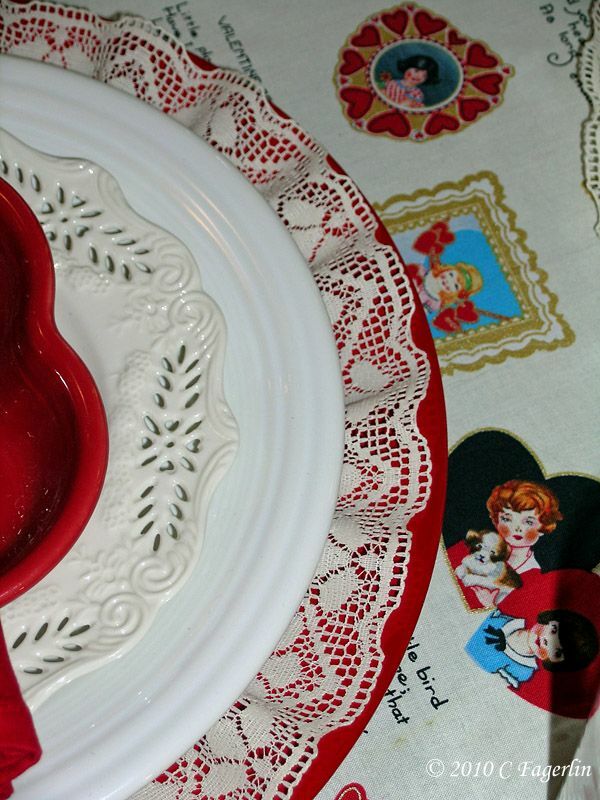 I love the tablecloth that you made and the ruffles - on the plates and the doilies. Thanks so much for being a part of Seasonal Sundays. The tablecloth is beautiful. 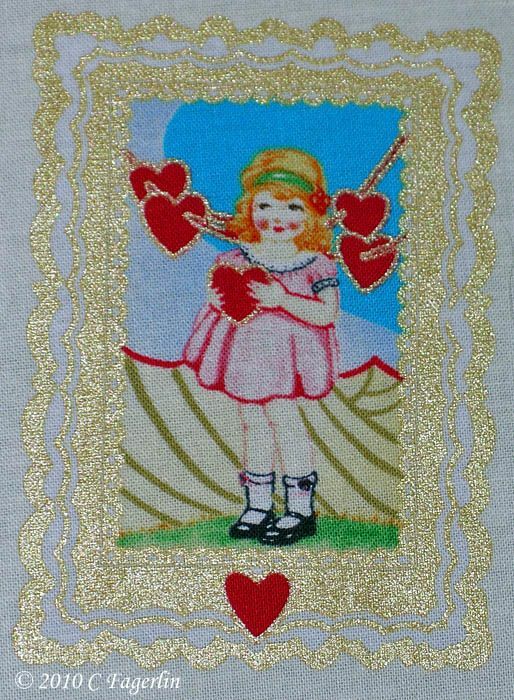 It reminds me of the antique Valentines that I collect and often use in my tablescapes. The heart-shaped Fiesta bowls are new to me; I love having something new to hunt.